The Group The 1st Lavington Sea Scout Group owns its own Grade II listed Scout Headquarters and purpose built boat shed in the centre of Market Lavington. The group is funded through income from property rents. Because of our financial security leaders can concentrate on working with their sections rather than take time out to raise funds. There are occasions when additional fundraising is needed, and this is organized by non-uniformed supporters. Beavers age 6-8 The Beaver Colony is run under the joint leadership of Hilary Shand and Mike Coleman, who started in October 2005. Colony evenings in the hall are a mixture of activities, and games, taking into account the short attention span of the Beavers. About half the evenings are spent out of the hall, either visiting places of interest in the district minibus, or taking advantage of the local countryside. During 2006 the colony visited both Tidworth and Larkhill Army bases, and the Air Ambulance in Devizes. Locally they have been on a Bug Hunt and have made regular use of the Elisha Sports Field. Anyone who wants their child’s name put on the waiting list should contact Colin Osborn. Cubs age 8-11 The cubs are meeting again after the summer holidays. Phil Burt is still Akela, after 16 years, helped by Francis our Assistant Cub Scout Leader. The Pack nights are mixture of discussion, games and activities linked to badges. Following the changes in scouting, the pack members have more involvement in deciding the activities that are run. The Cubs usually camp every year and have a history of supporting local charities as well as collecting items for Rotary Club Emergency Boxes. 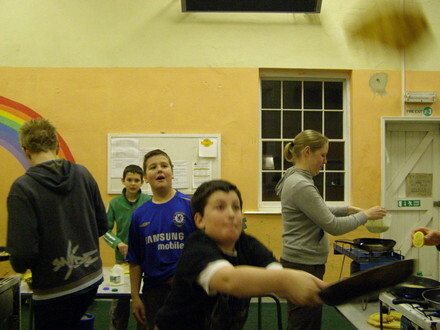 Last year the cubs took part in the BT Giant Sleepover, which included a midnight hike and a campfire cookout. Sea Scouts age 10 to 14 The Sea Scout Troop is run by Mike Grange. The Sea Scouts spend most of the summer term enjoying water activities. During the rest of the year they do the more usual Scouting activities, such as cooking, pioneering and playing wide-games. Scout Camp 2006 Cornwall The Sea Scouts had an enjoyable time camping in Cornwall at the beginning of August. They were on the water most days and went to a local swimming pool 3 times. All the leaders and helpers had fully recovered from an exhausting but exhilarating week, by mid- September. Unlike most camps we ran the risk of getting sunburnt. The Patrol Leaders have started planning activities for the coming year. 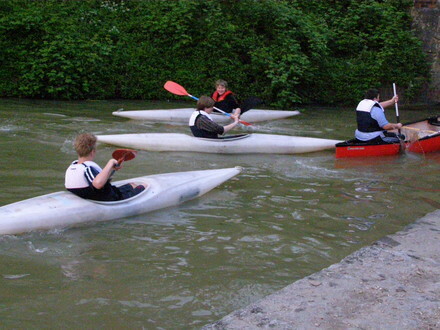 The Troop usually spends every Friday evening during the summer on the Kennet and Avon Canal or the River Avon. During the rest of the year they usually divide their time equally into outdoor adventure (wide-games or night- time cycle rides), scout skills (cooking, and pioneering), badgework and sport (swimming, skating and climbing are recent activities that they have tried). The Sea Scouts are led by Mike Grange who has been in scouting for over 40 years, helped by Lucy Plumb who has just joined the group.